Year-end reviews shape future planning - have you scheduled yours? I have learned a lot over the years just by listening to my clients. One way I listen to my clients is during their year-end review discussion. Although there is regular communication back-and-forth with clients throughout the year, in Field Services we plan for two major discussions during the school year. The first is a Galileo implementation plan discussion held during the start of Galileo use and near the start of each successive year. The second, which serves as the purpose of this writing, is the year-end review discussion. discuss professional development needs and new opportunities. So contact your Field Services Coordinator at GalileoInfo@ati-online.com or call 800-367-4762 today to setup your year-end review. These discussions can be scheduled in late April or May (after statewide testing) and generally last about an hour or so. Thank you to all who logged on and participated in the webinar March 20. 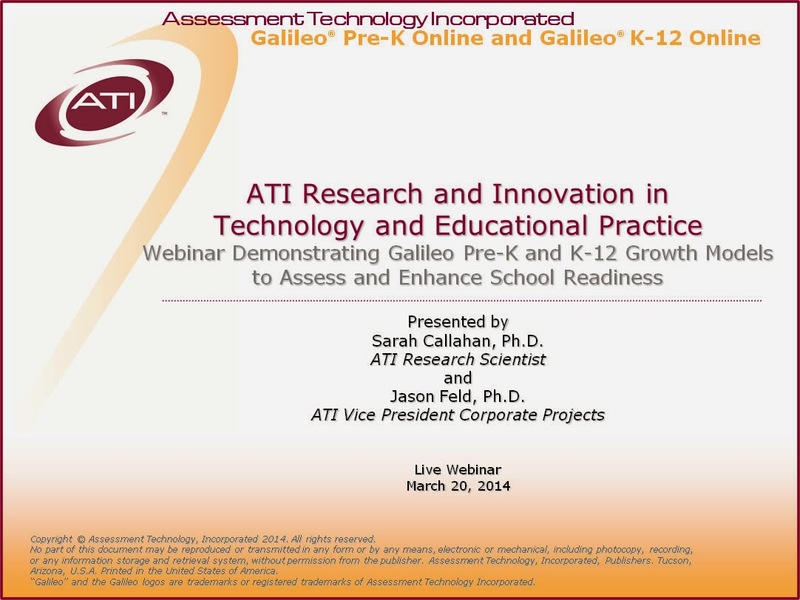 The ATI Research and Innovation in Technology and Educational Practice webinar demonstrated Galileo Pre-K and K-12 growth models to assess and enhance school readiness. If you missed it, or want to watch again, the webinar recording link is provided below. The national dialog on school readiness has shifted beyond its traditional focus, “readiness for kindergarten,” toward a more inclusive view highlighting the importance of readiness throughout early childhood and youth and extending to “college and career readiness.” This shift has been accompanied by major advances and innovations in technology, research, and educational practice. The webinar focused on recent ATI research and innovations that can assist early childhood programs, local K-12 school districts and charters, and state departments of education in achieving goals related to the new readiness paradigm. To learn more, watch the webinar recording. ATI conducted a study of inter-rater reliability on Galileo scales in partnership with three Head Start programs in the state of Ohio. Observations were conducted on three randomly selected children from each of 318 classrooms in these programs. The following table presents the results of the study indicating adequate correlations between the observations for the two observers. The means and standard deviations for observations for the two observers are nearly identical. This is consistent with the expectation that observer-measurement error for aggregated data will be low. These results provide evidence of inter-rater reliability for the Galileo scales. It is important to note though, that inter-rater reliability may vary based on the specific staff members conducting observational assessments as well as well-established phenomena such as observer drift. For this reason, ATI offers inter-rater reliability training designed to assist programs in training staff members to conduct reliable assessments. Learn more about inter-rater reliability professional development. ATI, in partnership with the Pima Joint Technological Education District (JTED), is sharing Pima JTED-developed Career and Technical Education (CTE) assessment items for use by school districts who are affiliated with Pima JTED or are participants in the ATI Community Assessment Item Banking (CAIB) program. These items can be used in conjunction with items developed by your own district's CTE staff, as well as with additional items shared by CTE professionals in other districts. These items were developed to align with Pima JTED curricular materials and reflect the efforts of CTE educators to align assessment items to Arizona CTE state standards. Please contact ATI's Education Management Services or your Field Services Coordinator to incorporate these items into your assessment plans for Career and Technical Education. Mark your calendars for this complimentary webinar, ATI Research and Innovations in Technology and Educational Practice: Demonstrating Galileo Pre-K and K-12 Growth Models to Assess and Enhance School Readiness, Thursday, March 20, from 9:00 a.m.to 10:00 a.m. MST / noon to 1:00 p.m. EDT. The webinar will be led by Dr. Jason Feld, Vice President Corporate Projects, and Dr. Sarah Callahan, Research Scientist, both with ATI. Galileo School Readiness Scales and reporting tools for birth through 5 years. Empirically based growth rates in multiple developmental domains for children birth through 3 and 3 through 5 years of age. Forecasting performance on the grade three statewide tests based on Galileo assessments in kindergarten through grade three. Forecasting performance on the statewide tests based on Galileo assessments in grades three through 10.